A yarn I started stocking and dyeing recently is this gorgeous DK Silky Smooth yarn, and I’m totally in love with it! Shown here in the beautifully wearable shade ‘Soft Denim’, this yarn is supersoft and smooth to touch, with a lovely drape and subtle sheen. It’s a cosy yarn with a luxurious feel – ideal to make a go-to snuggly winter accessory such as a hat or shawlette. I’ve had a browse on Ravelry (where else?!) 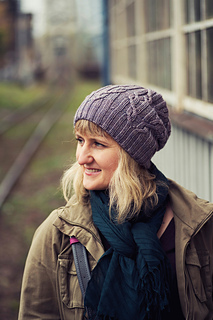 and decided to try it out with this free knitting pattern ‘Tied Knots‘ from Justyna Lorkowska. It’s the perfect blend of cables and wide rib, with a slouchy feel which should compliment the yarn drape beautifully. This yarn will be appearing in my Etsy shop in various colourways over the next few weeks – let me know your favourite and I’ll make sure it’s there! 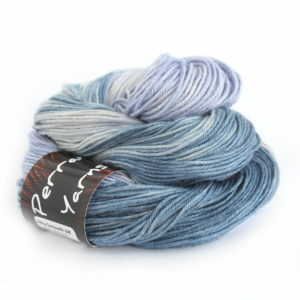 ← New Speckle Yarn Collection!